To say that I am excited about what God is doing here in Garretson would be an understatement. In light of God’s command to Israel, I decided to take some time and look over both my planner and prayer journal for the past year and reflect on God’s faithfulness. I want to preface what I am going to share by saying these things do not point to how great I am. They do not show how capable of a leader, how faithful of a Christian, or how good of a person I am. Everything that God has done and is continuing to do in Garretson brings glory to His name alone – I simply have the honor to participate in what He is doing. At The Rescue Church we value being involved in the community. We have already had some solid opportunities to serve those in Garretson before we have even launched a campus! The first event we held was in February when we had an informational meeting. We invited the community to come to Anne’s Coffeehouse in Garretson and we served them a free supper and answered questions about the church. We had around 25 people come to that first meeting. On April 19th, we were able to give the Garretson Community their first Egg Drop! If you have never heard about our Easter Egg Drop, it is basically an Easter egg hung on steroids. We take thousands of plastic eggs filled with candy and drop them out of a helicopter over an open baseball field and allow kids to get as many eggs as possible. I was a little nervous about how many people would come since there were not very many people that knew about the church. God surprised all of us and we had roughly 350 people show up! Watch this video for a recap. One of the weekly events we did in May is what we called the Garretson Community Group. It was a time for people in the community that were interested in The Rescue Church to come and hear about our vision and get to know some of the leaders. We did this on Sunday nights for four weeks in May. This was really beneficial because we were able to begin gathering a core group and get to know people better. One of the really fun community events we did in June was our first Outdoor Movie Night. We rented a gigantic inflatable movie screen and invited the community to spend a night watching Despicable Me 2 at the Baseball Fields. The event was completely free (as usual) and we provided snow cones, popcorn, and soda. Around 75 people from the community joined us for the free movie! As a community in Garretson, we have begun meeting once a month to pray for the people and churches here. This has been an awesome time of uniting with other believers from varying backgrounds to cry out to God on behalf of this town. We held our first prayer meeting in June with four people coming together. The next month, July, God gave more than 100% growth to this group! We had ten people – including a local pastor – join together and plead with God that He would send His Holy Spirit to fill this community! We will be meeting again for Community Prayer on Thursday, August 14th at 5:30pm @ The Treasure Chest. One of my passions is watching people begin to know God in a deeper way through studying the Bible. We began meeting every Tuesday at 12:30pm @ Annie’s Coffeehouse in Garretson to dig into the book of Romans. It has been really encouraging to see the people who are coming begin to have a deeper hunger for the Word of God. There are usually 4 – 5 of us who meet together on Tuesdays. If you are ever in the Garretson area, we would love to have you join us! This is the next event that is coming up and I cannot wait to see what God is going to do! 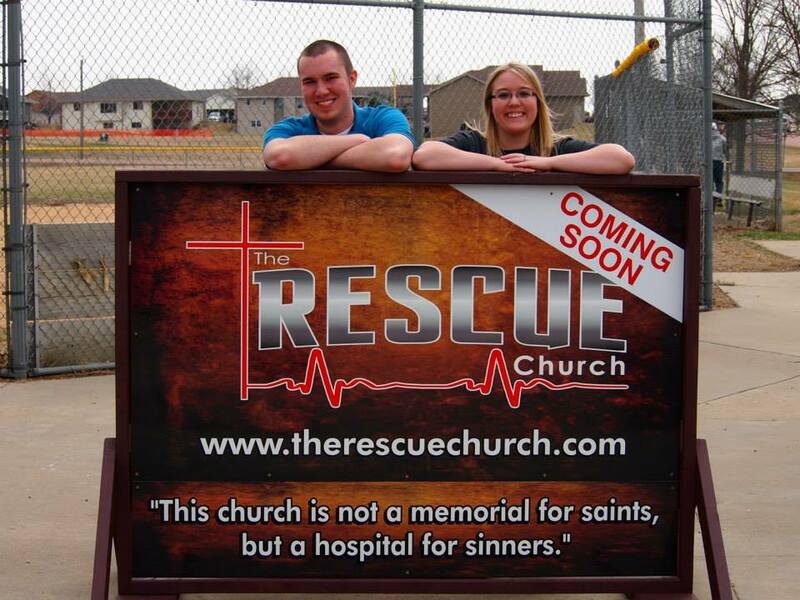 We are going to begin meeting this Sunday night (August 3rd) @ The Legion and will continue to meet every Sunday night until October 5th when we officially launch The Rescue Church in Garretson. The Pre-Launch Meetings will be informal and more of a discussion. The focus is going to be on praying, planning, and fellowship. The main purpose will be to continue to gather a core group of people to help launch the church in Garretson. As we get ready to launch, I will be the first to admit that we are in desperate need of God showing up in a powerful way. Below are some things that we need you to pray for. We believe that prayer is powerful and God responds to His people when we cry out to Him. 1. A core group of at least 30 people. As we begin to meet for our Pre-Launch Meetings I will be setting up 30 chairs every time. Our goal is to have at least 30 people commit to being part of the core group as we get ready to launch in Garretson. 2. 100 people on Launch Sunday (October 5th). Honestly, this sounds nearly impossible as I put it into writing. One of the things I love about our Faith is the fact that we serve a God who LOVES to do the impossible. I believe God can easily provide 100 people to join us and hear the Gospel on October 5th. Pray that this happens (and that we have enough room for them)! 3. Provision to remodel our building. One of the awesome things God has done in these past couple of weeks is provide us with a building. We are able to sign a long-term lease for a building in Garretson on Main Street. A person in Garretson who is part of the core group offered to pay all of the rent on our behalf so the building is free! We will still need God’s provision in order to prepare the building for worship services. 4. At least 25 people to come to know Jesus as Lord and Savior in our first year. Our passion is to reach those who are far from God. We have the tagline on all of our signs – “This Church is not a memorial for saints, but a hospital for sinners.” Pray that we can be a hospital for sinners who are in need of forgiveness. My prayer is that we see AT LEAST 25 people come to know Jesus between October of 2014 and October of 2015. 5. Pray for a Worship Leader and Rescue Kidz Leader.